How many of you fancy world-class education through MOOCs? If you are accustomed to online courses then it might be a piece of cake for you however many of us face difficulties with the virtual environment. In a bid to improve, the Michigan State University unleashed the first-ever robot-aided online learning which happens to improve the quality of engagement among students, instructors and teaching assistants. Fixed in the local recording area, equipped with video screens the robots are controlled by the remote users as per their convenience. Imagine a classroom with 10 students in it. Whether it is a group discussion or a hush-hush birthday surprise for the girl sitting next to you, you will need your body to speak as much as your mouth. With features such as "pan around and zoom", "real-time chat with eye-to-eye contact" make this a desired tool for a comprehensive online learning. According to Christine Greenhow, associate professor of educational psychology and educational technology at MSU, the technology helps students to be more engaged with the class since the instructor can now look them in the eye. Instead of a monitor full of faces in a conventional video conferencing, attention can now be given to one who demands. The related applications can also be extended to the telecommuters and students with special needs. 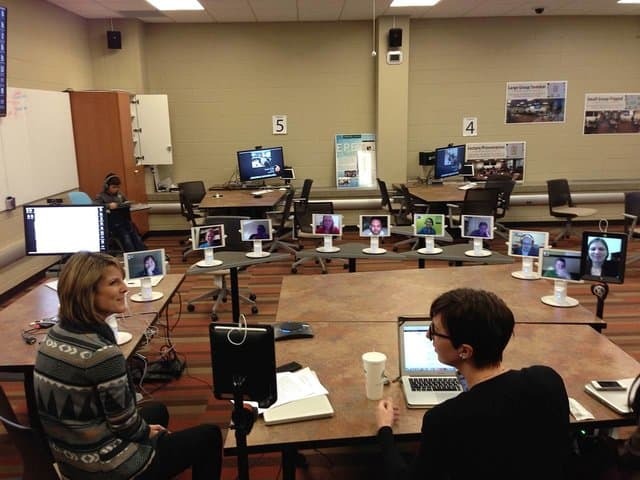 The immense improvement in the education technology field at MSU can be traced back to 2015 when Benjamin Gleason, a former MSU Ph.D. student, currently affiliated with Iowa State University worked in revitalizing the current educational platform via three methods including in-person, by robots and by traditional video conferencing. This way of face-to-face learning is known as hybrid or blended learning which single-handedly increased the number of students enrolled for quality education. Only with free-download software students and active learners can now achieve proper educational environment. The research has been published in Online Learning.